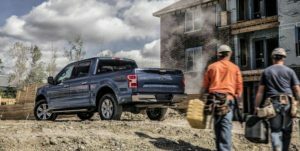 The Ford F-150 has been a staple in the Canadian workforce for so many years now that it can be difficult to keep up with its development. Since 1948, in fact! It remains one of the dominant workhorses in the market, with the power and performance you need on the work site. And that’s very much because the F-150 has been in a constant state of self improvement, becoming better and better to keep its place at the top. Ford engineers certainly have had their work cut out for them. When a truck goes through a “redesign,” that means some things were working and many others just weren’t for several years. But Ford isn’t waiting around when it comes to making their pickup better, today. So for 2018, we have a brand-new standard 3.3-litre Ti-VCT V6 engine that’s more efficient all-around than the outgoing one. Greater power and fuel efficiency make the 2018 model a better work buddy. The 290 horsepower and 265 pound-feet of torque prove it, and you’re achieving this at a respectable 13.1 / 9.8 (City, Hwy) L/100 km. Excellent for such a workhorse. You’ll also be getting great efficiency out of the 2.7-litre V6 and 5.0-litre V8, as they too have been improved upon. This theme of efficiency extends to the transmission too, with the 10-speed automatic transmission paired to both of these engines. An available turbodiesel V6 engine rounds out the engine choices here. But we’re not done yet: every 2018 F-150 engine now has Auto Start-Stop Technology as a standard feature so you won’t be burning fuel as you idle within the city or on the worksite. 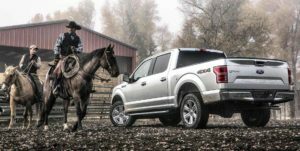 This is the most efficient F-150 to date, and one of the most efficient trucks available anywhere in the market. Ford engineers also decided to revamp the front and rear styling of the new F-150, giving it an even bolder look, and we think you’ll appreciate it yourself. Just take a look at that new grille and those new headlights! A revised bumper and tailgate complete the new look. You’ll also enjoy additional wheel choices for your new F-150. But the F-150 isn’t all brawn and show; it’s brain too. The new-and-improved forward collision mitigation system makes its case as your backup in the event of a collision. A smarter, safer vehicle is what you’re looking at here. So there you have it: the Ford F-150 2018 and 2017 differences. Your new 2018 Ford F-150 has almost arrived at Zender Ford. We’re expecting it this fall, and you’ll see it first here at Zender Ford. For further details, we welcome you to contact us at Zender, or keep your eye on our New inventory for 2018 and 2017 models.